Planned Parenthood is constructing a new $42.M, 8k-square foot building in New Orleans.The City of New Orleans has already approved the construction permit and the facility is scheduled to open later this year. It is estimated that 30 abortions will be able to be performed each day at the facility. Archbishop Gregory M, Aymond of the Archdiocese of New Orleans isn’t taking the news sitting down, taking direct aim at the facility in a letter published in the Archdiocesan newspaper, the Clarion Herald. For this reason, the Archdiocese, including the churches, schools, apartments for the elderly and nursing homes, will strive in its privately funded work not to enter into business relationships with any person or organization that participates in actions that are essential to making this abortion facility a reality. There are many issues, from violence in the streets to poverty, which hurt this community. A regional abortion center will not solve our problems; it will only create more….We hope that the community invested in the City of New Orleans and in her future will join us in standing for life, not more abortion. All citizens of the New Orleans area must stand together for a peaceful community, not one with more abortion and more Planned Parenthood. 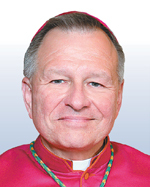 Kudos to Archbishop Aymond! His Excellency not only is attention to the facility, but also calling upon Catholics and non–Catholics alike to use their economic clout in the cause of life. Pressuring those who have or will be participating in this grave evil by entering into direct or indirect business relationships with the facility is a very clever way to challenge Catholics, in particular, to put their faith into economic practice. How’s that for some authentic Catholic social justice? Good for him. I hope they take his advice. On the phone…one to many (have’s) excuse me please. The blogger who shall not be named once said that we get the bishops we deserve. Parishoners of New Orleans need to rally around Archbishop Aymond on this vital issue in particular, but also the more routine requests for prayers and for funds and for support. They must let the media know that any attempt to drive a wedge between the faithful and their shepherd will fail. I think this is a winnable fight, and Aymond must be given the respect he deserves and the support he needs. And I recall the recent post here about pre-emptive surrender of the Vatican when they hired those accounting firms with strong ties to anti-life orgs. Maybe they can learn from Aymond. Hat tip to the Motley Monk! Praise God for this Archbishop’s public stand. Maybe it is too little too late, but at least he has spoken out and it is a beginning. God bless Archbishop Aymond for defending his church and his people, for being a true leader and foremost, for being a man of integrity and courage. Maybe he has set an example for other church leaders who have a tendency to dance in the world of “political correctness”. Assuming the mill operates at maximum efficiency, 30 per day, and assuming there are 220 operating days per year, that is 660 babies murdered per year. Assuming the building lasts 30 years, that is 19,800 murders. That gives an up-front fixed cost of $2,121 per murder. I guess the murderers get to do their jobs in a pretty nice place, huh? Just saying, the next time some dope brings up the spectre of “back alley abortions”, you can tell him exactly how much we have progressed as a society, providing truly palatial top-shelf surroundings for people to snuff out life. Black genocide – Planned Parenthood is following through on their “sainted” founder’s bigotry. I hope and pray that the good citizens of New Orleans and Louisiana, Catholic and non-Catholic alike, will head the archbishop’s call. The gauntlet has been dropped. I also hope that the Clarian Herald will print statistics of abortion including demographics of their city, state and country (Catholics Rock has provided a start) and then “out” the owners of the land who sold it to PP and anyone else who was and is associated in the government and commercial sector with the construction of this proposed abomination. So much of it will be tax money. My only request would be to change “perform” abortion to “commit” abortion. Let’s all pray that the building collapses or God sends a tonado to take it down. PRAYER DOES WORK!!! Let’s all also be determined to change our vocabulary. Abortion is a medical term. Let’s call it what it is. Killing a human and there are lots of that going on in PP “clinics” all over the world. They are killing defenseless, innocent human beings. If PP people think the world is too over populated, let them be the first to give up their place in this world – for the good of the world!! If they think they are getting rid of the lowest form of humans, let them look in the mirror! 30 yrs x30 is 198000 deaths. God help us all who do nothing to prevent this. Correction: 30 yrs x 6600 is 198000 deaths. Praise God for Archbishop Aymond’s courageous stand for life. You can count on my prayers, Archbishop Aymond. You will have a difficult time ahead, and it might have started already, but know that you are walking in the footsteps of CHRiST. 2 Chronicles 7:14 – but in that prayer to God there is God directed action to fight against this holocaust that is perpetrated by evil inspired men and woman. Those who run for office spouting euphemisms of reproductive rights, pro-choice, and planned parenthood need to be replaced. Take the time to investigate their platforms and if they mention a woman’s right to choose, vote against them. There are those who champion the ‘sustainable planet’ such as Soros, Gates, Sibelius and others…all seek to do this through murder of the most innocent. And as Margret Sanger, the founder of Planned Parenthood espoused population control, remind those brothers and sisters of all races that these people target the most helpless among us. This evil will not stop without humility before God, prayer and fasting to our brother Jesus Christ, and God inspired action. Thank you Archbishop Aymond. God bless Archbishop Aymond! He has taken the bull by the horns and is doing what we wish every Bishop and Archbishop would do! It takes someone who really lives his faith to do this. Where are the others?!?! Roger C. Thibault Amen, praised be Jesus & Mary, now and forever God save the babies! Amen, praised be Jesus & Mary, now and forever God save the babies! Margaret Sanger who started planned parenthood and hoped for the day when all those undesirable non wasp babies could be greatly curtailed must be dancing for joy in the afterlife that her dream is being fulfilled by her wasp descendants in the city of New Orleans. More power to those ladies who agree with her goal for starting planned parenthood: quote from Margaret Sanger, “those black people, human weeds, reckless breeders, spawning human beings who never should have been born.” Yes all non wasp ladies you are liberated just like Margaret Sanger had hoped. Your Excellency, that’s a good start, but how about those Catholics who endorse with their name and support the pro-abortion Democratic Party, giving it the ELECTORAL POWER to keep abortion legal? Catholics are the largest single group of people in the Democratic Party. That includes the clergy, as well; of those who are registered to vote, the majority identify with the pro-abortion, pro sodomite “marriage,’ anti-First Amendment Right of Freedom of Religion, anti-God Democratic Party. Catholics don’t have to register Republican, which is solidly pro-life, but just register out of the worldly organization that is diabolically opposed to what Catholics profess to believe and pray for. The Holy Spirit has truly come down to inspire the Arch Bishop for his outstanding action. God Bless him and all that follow his actions. Praise God for the Bishop to speak out against Planned Parenthood. in Ct. they will be voting on a bill legalizing Assisted physician suicide March 5 we hope and pray it is defeated. Our culture of death is growing more ominous each day, we pray that this Lent we can bring about some change for the sake of our children and grandchildren, through our prayers, sacrifices and fasting. This culture of death will bring about the destruction of our beloved country, and so many people take it for granted that things will be the same as we have always known it. May God give them eyes to see. You may find the following links of interest regarding efforts to combat the pending legislation in Connecticut. If you are from Connecticut, you may want to learn more about Connecticut Right to Life..a very worthwhile group.